A British couple have spoken of their terror after a humpback whale nearly squashed them to death while kayaking in Monterey Bay, California. Tom Mustill and Charlotte Kinloch were among a group of kayakers who were returning from a whale-watching trip when a whale suddenly performed a full 180-degree breach right next to their boat. It looked as if the whale, which is estimated to weigh 40 tons, was going to land on top of the couple. Fortunately it only clipped the edge of their kayak pulling the couple underneath the water. Kinloch told the Telegraph that the force of it felt like “being in an avalanche”. Remarkably the couple were not harmed and the only permanent damage was a small dent on the kayak. Mustill has told press that he though he was going die when he saw the whale above him. “I remember coming to the surface and thinking, ‘How am I not dead? Maybe I’ve got lots of injuries but I’m in shock and can’t feel them’,” he said. “Then I saw Charlotte and thought, ‘How is she not dead?'" 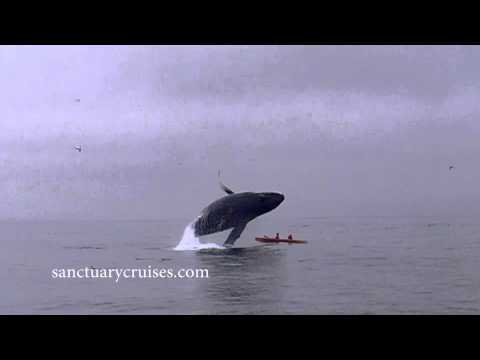 The entire incident was captured by a passenger on board a nearby whale-watching boat operated by Sanctuary Cruises. This is just the latest in a series of close encounters between humans and some of the ocean's more dangerous creatures. Champion surfer Mick Fanning recently narrowly escaped a shark attack and there have been numerous reports of shark attacks on boats - although a new report has confirmed that the risk of shark attacks has plummeted since the 1950s. If you are also into adrenalin packed animal watching don’t miss our guide to the best places in the world to swim with sharks.